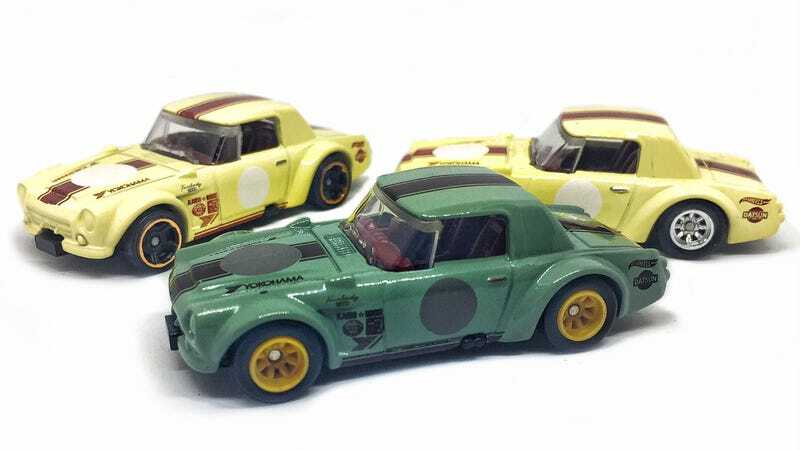 I’m a big fan of the recent Fairlady 2000 release by Hot Wheels, and have done a few wheelswaps with some of the ones in my collection. I experimented recently with using RIT dye on another casting that I may do a post on soon, and while that one was somewhat successful, I threw a Fairlady into the dye bath along with the initial test casting and came up with this green beauty. I can’t really offer any suggestions regarding the dying process as I didn’t quite achieve the results I intended on my two tests, but it is certainly an interesting customizing option. There are other write-ups and videos on various sites covering the subject (some more useful than others), so I suggest doing a bit of research if this process interests you. I’m going to play with this concept a bit more now that the chaotic holidays are nearly over. I also realized after I called this completed, that the next version coming out of this fairlady is almost the same color as this one ended up being!